On the heels of Earth Day, the City of Charlottesville and vendors at the weekly Charlottesville City Market continue to promote sustainability and minimize their environmental impact. Directing materials away from the landfill – to instead be recycled or composted – maximizes use of those materials, reduces the need to source new materials, lowers greenhouse gas emissions, and produces improvements in water and soil quality. Starting in 2015 as a pilot program called Charlottesville Composts, the City Market hosted a drop-off point for area residents to bring their household food scraps to be collected and composted. 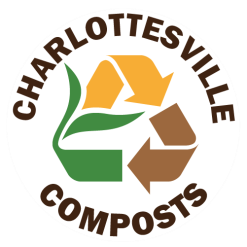 Additionally, the Charlottesville Composts program helps sustainably manage the waste streams from the Market by providing 3-bin waste stations (Composting, Recycling, and Landfill) and assisting vendors to find recyclable or compostable items for serving food. This Saturday, April 29th, Charlottesville Composts and the City Market are going further with a Zero Waste Day, aiming to generate zero pounds of landfill waste. Vendors at the City Market have participated both by separating their food scraps and by using compostable or recyclable foodservice-ware. Market attendees can ask questions and learn more at the sustainable waste stations located throughout the Market. This Zero Waste Day is supported through generous sponsorships of Virginia-based manufacturers Vastly, World Centric, and Natur-Tec who have each donated certified compostable food service-ware. Area residents and visitors are invited to come enjoy the City Market this Saturday, April 29, to experience Zero Waste Day, and learn more about how to participate in the free and easy compost drop-off program. For more information regarding composting programs, and to sign up for email updates, please visit www.charlottesville.org/composting or email composting@charlottesville.org.